Are you in Back To School prep mode? (Or did you already go back?) 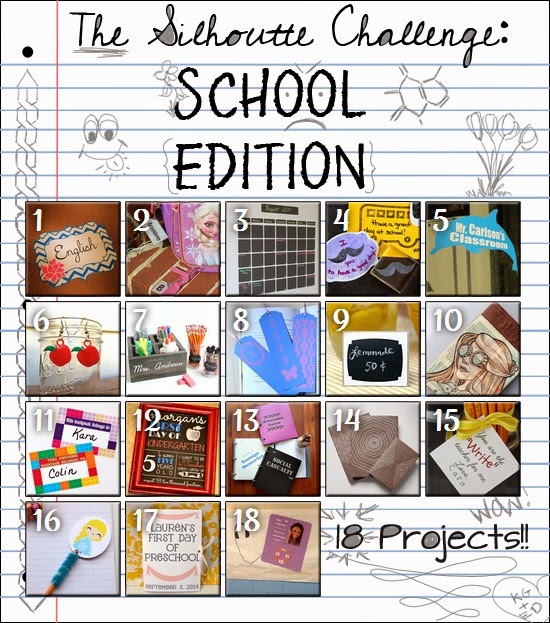 Jo starts soon, so the Silhouette Challenge – Back To School theme couldn’t have come at a better time! Since I’m pretty certain my daughters Frozen bag is going to be one of MANY hanging from the hooks of the classroom I decided to add a Personalized Bag Tag so that the teacher would know which one is her’s (& her cousins). This project was so easy! So I am not going to give you a full tutorial since you really don’t need it. I literally took an acrylic photo key chain ($1 at AC Moore), traced the fake photo image on a piece of glittered card stock twice (make sure to reverse it). Glued the sheets together with glue dots (which were awesome by the way), & inserted it back into the frame! I used my Silhouette Machine, so I: cut the name and the first initial out of black glittered vinyl, added transfer tape and adhered to the acrylic frame and I was done! If you do NOT HAVE A SILHOUETTE MACHINE, you should pick up scrapbook stickers while you are the craft store! Hold them up to the acrylic frame to make sure they fit, and center accordingly! But wait, don’t go just yet! Make sure you check out 18 of my Silhouette Buddies below.. I’m sure they will fill you with TONS of Back To School Inspiration! These are super cute and a fabulous idea! I’ll have to do something like this for my boys… you know how they loose things, LOL. Kids love things with their names on them! My daughter has a Frozen backpack for this year as well. I think there might be a *few* other girls with the same. Thanks for sharing this easy project. Super adorable project! Those teachers must love you especially with the Frozen craze!! Simple, cute and a great way to personalize. I would have never thought to use the acrylic key chains, but it works so well. I’m sure your little one loves it and her teacher will thank you for it (I know I would!). That is one sparkly book bag! I’m sure your daughter loves it! And yes, I would bet you anything that labeling the backpack with her name will get you brownie points. It’s not like Frozen is popular or anything right now! This is such a great idea! Who doesn’t love glitter, right? !